Fact is, not everyone wants or needs a big boat. Many fishos can’t afford a 6-7m offshore fishing machine, they don’t have a car large enough to tow these hefty vessels or a garage with enough clearance and size to store a large cabin boat. This is where a more compact option like the 490 is useful. The best part about the 490 is that most of the features which make Bar Crushers such great fishing boats remain integral to this pint-sized model. Top quality plate alloy construction, a deep vee hull, ballast chamber, fully sealed deck and rigid sub frame, plus various other well known Bar Crusher attributes, are all standard on the 490. Rod from Sydney Bar Crusher dealer Blake’s Marine met me at Botany Bay for a run in the new Crusher. Only that morning he’d sold the boat to a keen 76-year-old fisho after a test run on the bay. The local fisho was after a quality boat, but didn’t want anything too big or difficult to manage. He also needed a stable, soft riding hull. The 490 ticked all of his boxes and after the test run he was sold. Those same prerequisites apply to many of us. A boat that’s cheap to run and easy to manage will, in many cases, see more time on the water than a larger vessel. Bar Crusher has released two versions of the 490 – the 490C tested here – and the 490WR, a walk around style centre console. Both models are based on the same hull and, depending on your style of fishing, would serve different purposes. The 490C is an ideal two person boat for estuary and light offshore fishing. The cuddy cabin configuration matched with Bar Crusher’s Gen2 hull design allows fishos to chase fish like snapper and kingfish around inshore reefs or target estuary staples on the drift or at anchor. The WR model, on the other hand, is better suited to lure and fly casters who appreciate an open layout. At the transom a modest boarding platform holds a berley bucket and ladder. In the centre there’s a newly designed cutting board with drink and knife holders. Underneath, Bar Crusher has added a shelf for holding batteries and oil bottles (if rigged with a DI two-stroke engine). The only thing missing from the transom area is a live well, although this is taken care of by a removable livebait tank baitstation (an optional upgrade from the standard baitboard that’s part of the package). Gunwale height around the boat is generous, making you feel nice and safe in bumpy conditions. The gunwales themselves are extra wide and feature padded grips and flush-moundted rod holders. The wide gunwales and tough checkerplate floor gives the feeling you’re standing in a much larger boat. The deck features a shallow kill tank, another unique and handy feature on a small boat. Further forward and Bar Crusher has added a nice feature formerly found only on its larger models. Each seat mount features a rack of tackle boxes, a convenient way of storing tackle within easy reach of the cockpit, yet out of harm’s way. There’s an option to have fold down seats too. This would suit someone looking to utilise as much space as possible. The dash area on the test boat featured an optional Garmin marine electronics gauge. The 60hp Suzuki on the test boat comes standard with a more basic Garmin gauge. This dash area would best suit a sounder/GPS unit up to about nine inches. There’s also more space on the shelf above. Being a relatively small cuddy cabin style boat, you can’t expect the same sort of dash space as a larger model. Even so, there’s additional space under the dash for a marine radio and stereo. The checkerplate floor extends under the protected cabin area. The cabin is built for storing gear with no bunk and is equipped with a small rail to stop things sliding out while under way. There’s also a generous-sized hatch for accessing the large anchor well. The 490, along with the 535, 575 and 615 models, features Bar Crusher’s Gen2 hull design. The Gen2 hull consists of a wider reverse chine running forward, optimised wider chine aft and the ‘Delta Flare’, which Bar Crusher says provides greater hydrodynamic lift for more efficient planing and improved fuel economy. A higher bow and improved spray deflection allows for a dryer ride and better stability at rest. Stability with two average sized fishos onboard was good and about what I expected for this style of boat. As previously mentioned, Bar Crusher’s 490C features the nifty Quickflow water ballast system. At rest, water floods the keel from stern to bow and provides the boat with additional stability. The water quickly drains out when underway. Given the boat’s sharp 16 degree deadrise, a necessity for a soft ride, the flooded keel offers a level of stability not often found in this style of boat. We tested the new 490C on Sydney’s Botany Bay in very average conditions. A recent downpour left the water muddy and strewn with obstacles, while a stiff 20 knot southerly and outgoing tide created plenty of chop. A perfect boat test day! Running the boat side-on to the chop allowed us to test the Bar Crusher’s dryness. While some water came onboard, the generous reverse chines and cabin substantially limited the amount of spray flying around. In a following sea the Bar Crusher gave a good account of itself and was noticeably predictable in its behaviour. Likewise, punching head on into the chop was about as comfortable as you’ll get in a sub-5m plate alloy boat. An average speed of 18 knots and 4500 RPM allowed us a safe and comfortable cruise using 8.5 litres per hour. Wide open at 6100 RPM and 30 knots, the boat rode soft and dry, using 20 litres per hour. Pretty impressive! The test boat featured a 60hp Suzuki four-stroke. 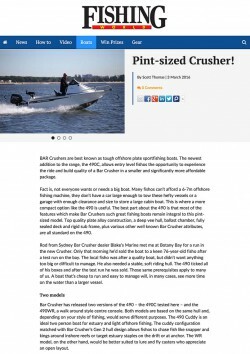 Bar Crusher rates the 490 from 40-70hp. While it wouldn’t hurt to go for the maximum horsepower, I found the 60 perfectly adequate with ample acceleration across the entire rev range. The test boat came packaged with an Easytow trailer and Bar Crusher’s popular Bar Catch which makes launching and retrieving easy with a mechanism that, as the name suggests, ‘catches’ your boat. Given the size of this boat and convenience for solo fishing, the Bar Catch is a very useful feature. With a starting price around $35,000, this pint-sized Crusher opens up a new market for its builder. Only slightly more expensive than a standard pressed aluminium boat, the 490C offers build quality and features otherwise only found in larger offshore boats. Of course, there are pros and cons of each boat type and there’s nothing wrong with the average tinny. But for someone looking for a small boat capable of punching above its weight, the 490C is a great option.